Why Should I Vote in the Convocation Elections? The first reaction to any discussion of Convocation at UWA is often a question - "What is Convocation and what does it do?" Historically, the term "Convocation" was used in university contexts to refer to a calling together of members, so that they could assemble formally to legislate or deliberate on matters. At UWA, the term Convocation is found in the original 1911 Act of Parliament which established the University. The University is described in the current UWA Act as consisting of “a Senate, Convocation, staff and students”. Convocation is an enduring legal part of the University, comprising mainly the graduates of the University, whose living numbers approximate 125,000. All of these graduates are lifetime members of the University. If the numbers of individual graduations are plotted* against recent decades and those before 1969 the numbers are not surprisingly strongly biased towards the recent decades. The recent change in course structure means many students at UWA are already graduates and members of Convocation, so it is important they know Convocation, its work and contributions to UWA. 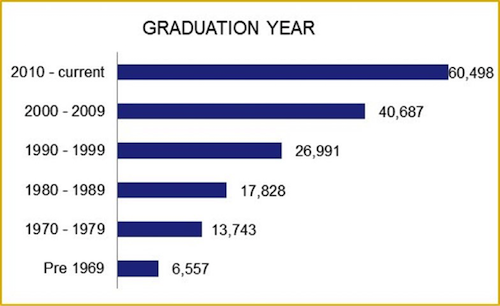 With many graduates holding multiple degree from UWA it is easy to understand why the number of graduates varies from the number of graduations. Many who graduate are exposed to Convocation for the first time when the Warden welcomes them to Convocation at their graduation ceremony. So why is the first question about Convocation often the same - What is Convocation and what does it do? At the Crawley Campus, Convocation is represented by the Convocation Officer, currently located within the Office of Development and Alumni Relations*. Previously there has been an independent Office of Convocation. Nowadays there are only two locations on campus that reflect Convocation. The Irwin Street Building, the original UWA building, was moved to Crawley in 1931-3 by the University. The buildings were threatened with demolition by the late 1970s. Convocation proposed relocation and renovation and fundraised extensively. A plaque on that building names the Convocation meeting room. The building is better recognised as the Cricket Pavilion. More recently Convocation contributed to the significant refurbishment of the Masonic Hall on Broadway, recognised in the Convocation named Boardroom in the new IQX. An avenue of trees to be planted by Guild Presidents along Saw Promenade, beside James Oval, will become Convocation Walk. The University Club has welcomed Convocation's planned placement of an active storyboard in the Corridor adjacent to the café, to display Convocation's topical information. "The Club" magazine will include Convocation Conversations, stories about Convocation and our members. 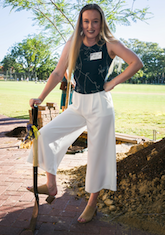 In the near future it is hoped that any map of the Crawley campus will feature locations that signify the importance, status and durability of Convocation at UWA. *Thanks to DAR for the graduation statistics.